Healthy children are being unfairly discriminated against, based solely on their vaccination status, during incidents of disease in schools. 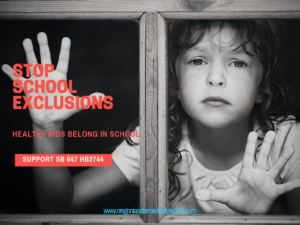 Since last spring, we have seen an increase of school exclusions, where unvaccinated students have been kicked out of school for 21 days, or longer, based on their vaccination record. Conversely, a student who gets a vaccine is allowed back into the school the next day, even though it would take days or weeks for them to form antibodies against infection. Fully vaccinated students may be ill with a disease, such as pertussis, and may be spreading it to their school contacts. However, these students are not typically tested for the disease since they are vaccinated. It appears that OHA is pushing for these exclusions now, where they have not in the past, as a tactic to increase vaccine uptake. Excluded students are being adversely impacted by exclusions by losing out on valuable instruction time, college credits, and even activities such as graduation ceremonies. Families who have children already struggling in school with IEP’s or 504 plans are devastated by a mandatory 21 day exclusion, while on the other end of the spectrum, those with honors students and high achieving students find their GPA’s hurt, loss of college credit, and reduced chance for scholarship or specific college entrance they have been working hard for. And every student in between is negatively impacted by missing school days. Research has shown that even as few as 2-3 days of missing school has a measurable negative impact on student academic performance and outcomes . Missing extensive amounts of classroom time also causes a tremendous mental, emotional and financial burden on families. This bill would restore equity and common sense by excluding individuals who have actually been exposed to the disease, and are showing symptoms, regardless of whether or not they have been vaccinated. Healthy kids belong in school.